In-flight (10 hours). We are in a new 777 with on-demand movie, TV, audio, and game channels – hundreds of selections! Is this cool or what? In fact, there is a lot less here than meets the eye – a choice of 12 “current release” movies is not thrilling if they are all unwatchable. I took a look at “Journey 2: the Mysterious Island” – the Teletubbies have better visual effects than this. I go back to my 19th century media – back issues of Science News Digest and the New Yorker. Mom was excited at first also, but a choice of hundreds of media options is not very useful to a visually impaired nonagenarian if the choices are unreadable – small light blue type on a medium blue touchscreen just doesn’t cut it. I try to pick a movie she will like and she settles in with “As Good As It Gets”, struggling to make the audio phones fit over her hearing aids. Fortunately, she is able to sleep. In-flight meal – I get lucky – there is an extra vegetarian meal in the galley – a nice spicy curry of corn, peas, and chickpeas over rice. I set aside the triple brownie for future need. Mom gets the chicken and eats a good bit of the chicken, rice, and salad. I snag her brownie also. “Breakfast” is a disgrace” – a “croissant” as fluffy as a baseball bat, six small chunks of unripe melon, half inedible. I blush for United, imagining the feelings of the passengers used to the amenities on Lufthansa and other state-sponsored airlines. We land in Frankfut at 12:32 local time. Our connecting flight leaves at 1:25. The stewardess assures me that we can make it. Despite some nervous moments, and thanks to the kindness of strangers who yielded prority seats on the bus and offered many helping hands, we do. 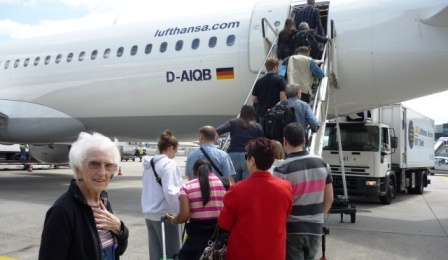 A special commendaton to the harried service staff for Lufthansa at Frankfurt, faced with a plane-load of slow-moving seniors and families with tight connections to various vacation places. They maintained patience, order, and control over the anxious horde, several electric carts, and assorted wheelchairs. A special shout out to Eilika Williams, our personal chair navigator, who wormed us through secret passageways, forbidden gates, and past long security lines, all the while maintaining a cheerful stream of chatter and a wide smile to allay Mom’s anxiety. We are aboard the Lufthansa flight to St. Petersburg. At first we are seated far apart, but the kind gentleman in the aisle seat moves up one row, which allows Mom to move up, and we have a whole row of three seats to ourselves! They serve a hot meal. I finish a Smithsonian magazine, play a few rounds of solitaire, think, write a little. The St. Petersburg Airport – Arrival. Chaos. No wheelchair here, no magic card or helpful genie to speed us through the queue. 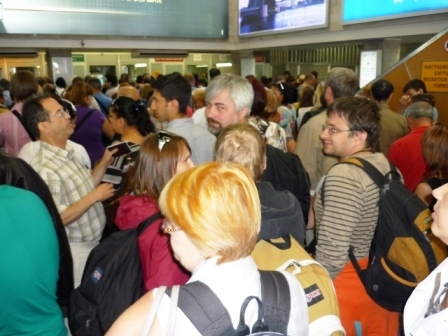 Actuall, “queue” is a misnomer, implying some sort of order or sequence. We simply merge into a tidal wave. My ex-colleague and now friend Maxas is waiting for us as we exit from customs(after standing in queue for nearly an hour – did I ever miss Japan!). He packs all our stuff into his snazzy red French mini-van, gives us a quick tour of the central city sights (the Bronze Horseman, the Winter Palace, the Nicholas Istatue, the Legislative buildings, the Nevsky Prospect, Dostoevsky’s house) and deposits us at our hotel, together with the baggage which requires two trips in the tiny elevator to convey to our room. After our R&R we venture out, walking around a huge building which hadsbeen re-purposed into a shopping mall. 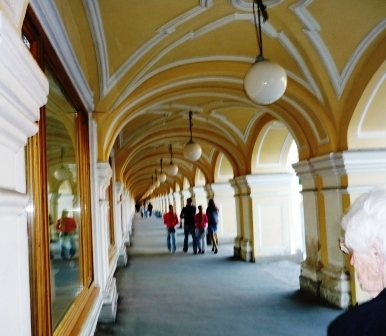 (We later discover that this is the famous Gostinyy Dvor, the oldest department store inthe world, now carved up into a series of small bourtique shops. ).We make it to Nevsky Prospekt where we see lots of happy looking people in various shades of style walking, chatting, swigging beer, and watching street performers. We do not make it to any notable sights as hunger overtakes us. We are surprised to be told at the little café that they did not serve anything but coffee, tea, and pastries after 10PM – it is still quite bright outside and we had no idea it was that late. 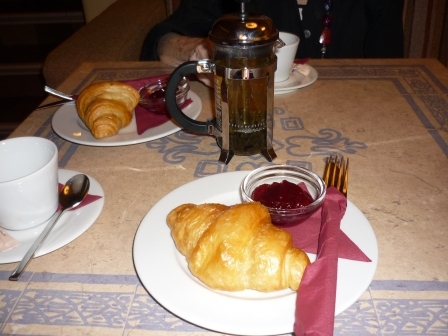 Fortunately the croissants and jam we ended with are delicious, as iss the tea we share . We find our way back to the hotel, feeling triumphant – we have arrived! We have explored! We have eaten! We are in Russia, the hidden, secret, unknown mystery of my childhood, fantasized as a place of gray, treeless, empty streets , now revealed as a bustling place full of life and color and exhiliration. It all seems a bit like the Emerald City of Oz.